But, it was so much more than that. We went on this trip not as a vacation, but as an adventure. We set off back in November knowing that this trip would change us. We knew there were answers we needed to find, and by staying in Connecticut we would not get those answers. 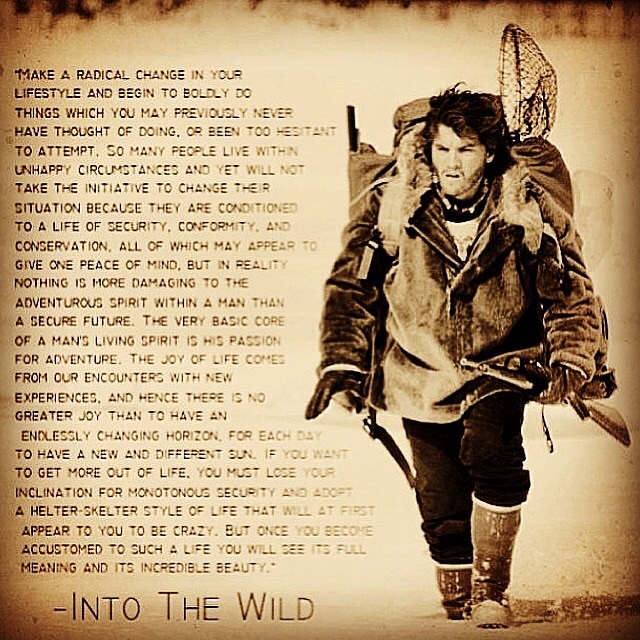 We needed to leave the comforts and safety of home and see what else was out there. We needed to leave our daily routines and jump into the unknown. Only by doing this would we be able to answer some questions that were burning within. If there is something that keeps pulling at your heart and you can’t stop thinking about it, GO DO IT! Until you do, you will never know. Do not wait for the perfect time, it will never come. Instead, trust that once you make the leap, the pieces will fall into place. All of the things you stress about….the “what ifs”, they probably won’t happen. And if they do, they are NEVER as bad as you create them to be in your head. I recommend the book The Alchemist to guide you to follow your heart. We have way more than we need. We lived in a 20ft camper with 2 plates, 2 coffee cups, 4 towels, etc. We brought less than 1/5 of our clothes and we still had too much. We had all we needed, even though it was so little and it felt so good. As Zac Brown says in his song Homegrown, “I have everything I need, and nothing that I don’t” When we got home we couldn’t believe how much stuff we had, and we probably have 10% of what most have. Our condo feels like too much wasted space, our plates way too heavy, and our coffee pot way too big! 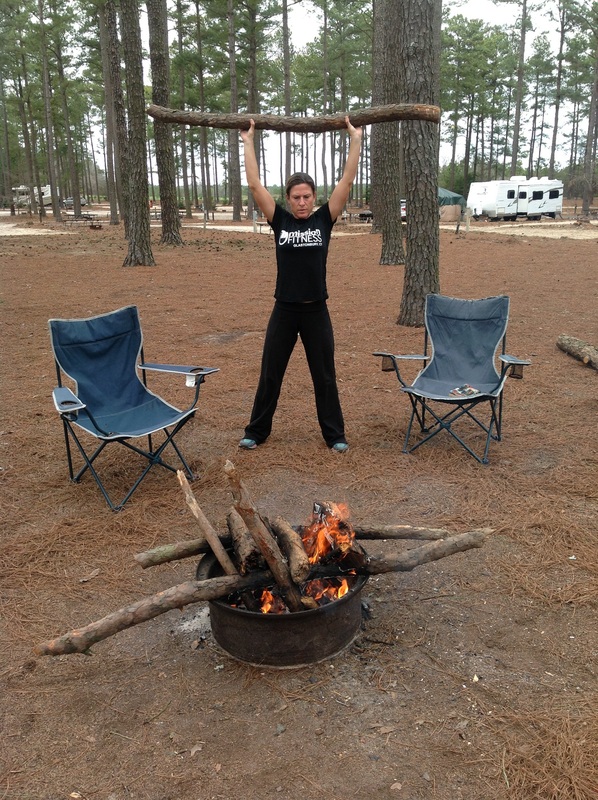 While there were times I felt like I could spend the rest of my life in a camper, traveling full time, I did not expect to miss my network of fitness peeps so much. Not only did I miss the ability to text someone to ask them to run with me, but also being surrounded by so many inspiring people. As time passed, I started to get comfortable with an average life when it came to fitness. I was mostly around people who thought 3 miles was a long run, and a morning walk was their exercise (side note: this is fine, any exercise is good!!!! It’s just not me). I started to convince myself that I didn’t need these crazy fitness goals of 50 mile races and a happy life for me can consist of just getting exercise every day and eating well. Then I would do a challenging workout and it would spark that fire again. That feeling that ONLY pushing yourself past comfortable can bring. Or I would talk to a client on the phone and remind them of why we do these crazy races. Why we aren’t meant to be average. These workouts and conversations would make me miss my mission FITNESS family like crazy. They remind me why average does not bring me happiness. Happiness is on the other side of fear. It’s on the others side uncomfortable. And too often we convince ourselves we are happy and average is fine. When it comes to fitness and life, we HAVE TO do what we think is impossible to really see how far we can go and how happy we can be. Surrounding yourself with a network of positive people and those that will inspire you is HUGE!! Our final stop was ironically the first stop I planned when we started putting our dream into action. I had emailed this resort back in August, inquiring about Workamping opportunities. 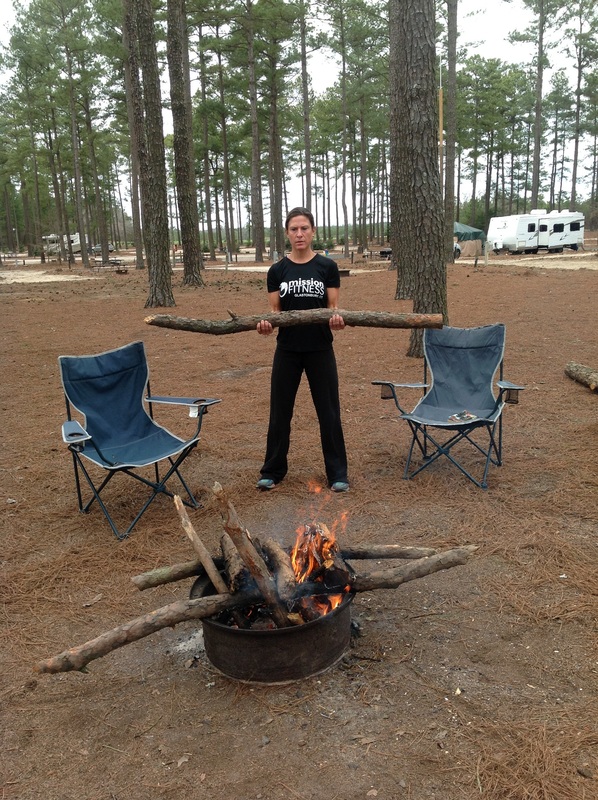 The campground Manager called me and said she would love help, so we decided on March 2-23rd. Our first campsite was booked! 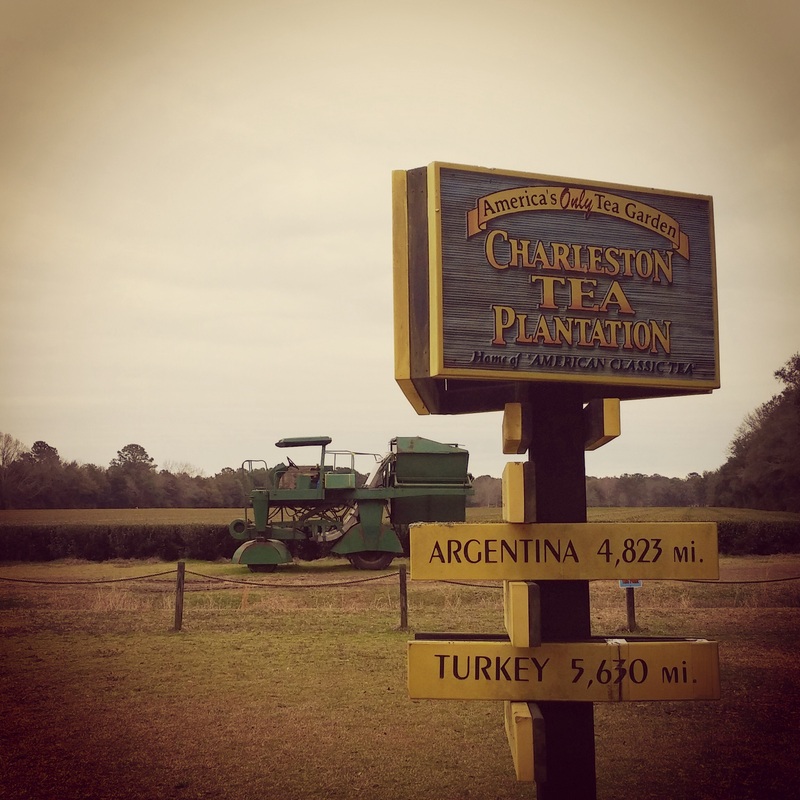 Fast forward almost 6 months….We left Charleston and drove 3.5 hrs Northwest to Jackson Springs, NC. As we made our way into North Carolina, the landscape began to remind us of the land back home. With this came a pleasant feeling….a sure sign that we were missing home. 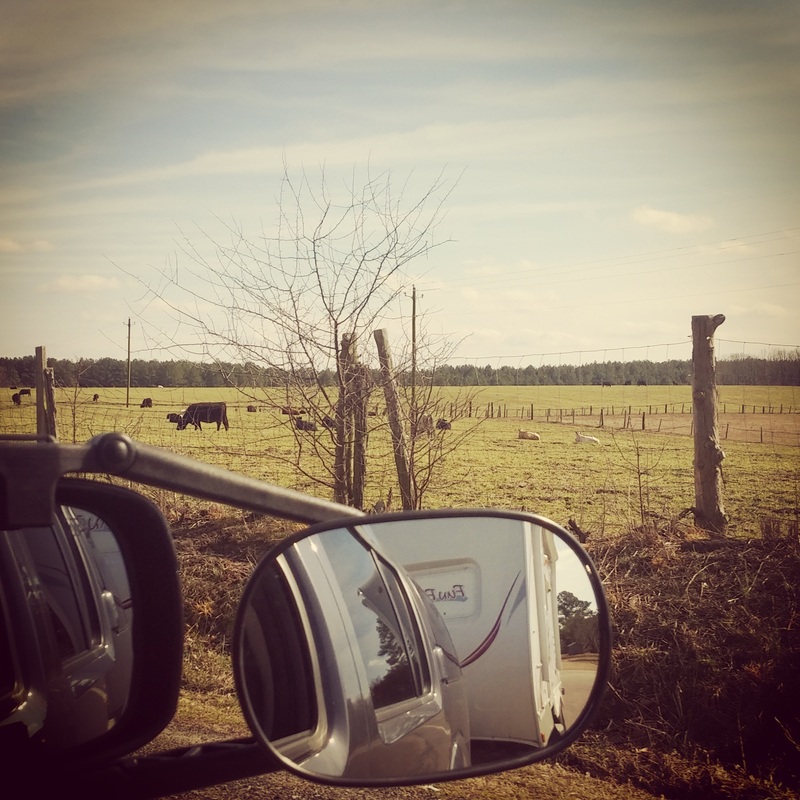 We were very surprised to see that our campground was surrounded by tons and tons of farmland. As soon as we made our way down Sycamore Rd and into the Campground we knew that this wasn’t going to be your typical campground. This was a resort….a 5 star resort!! 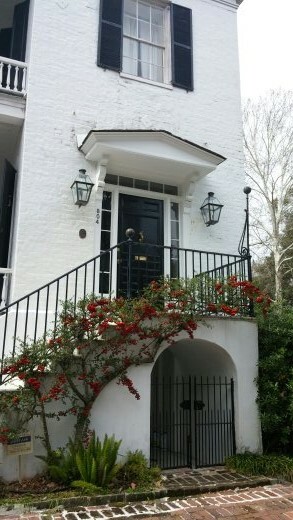 A meticulously landscaped entrance. A beautiful lodge that made you feel as though you had access to a five star bed and breakfast. Miniature Golf. Horseshoes. Shuffleboard. A beautiful lake. Amazing cabins. A game room with pool tables, flat screen tv, foosball, etc. A dog run. Here a bunch of pics so you can “get the picture”. Our dream of having a tiny home with only pine needles as our lawn had come true. 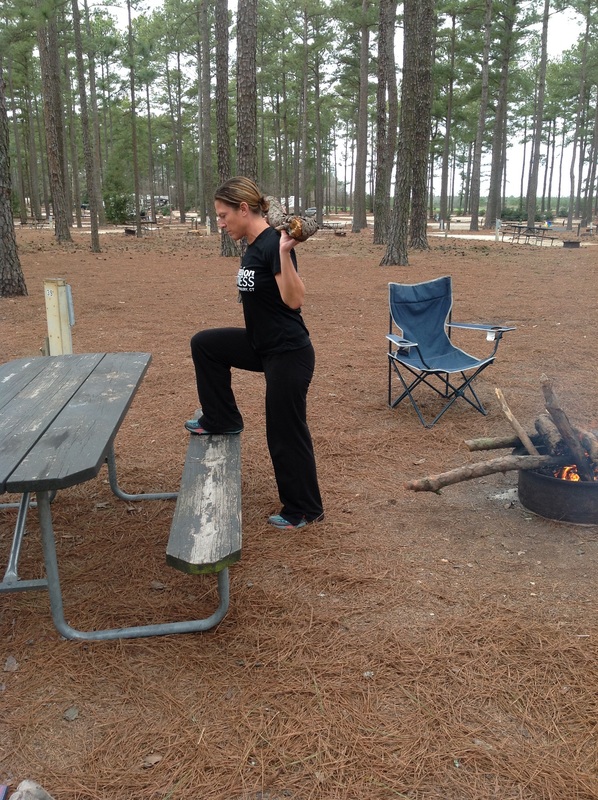 We were camping amongst the pines!! 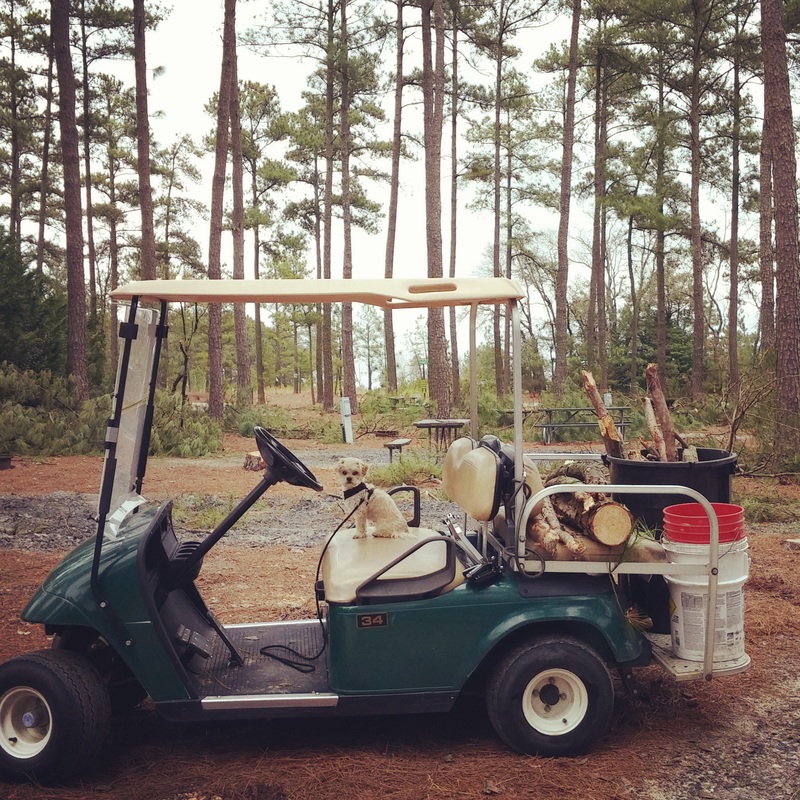 Our job was to pick up the pines cones and sticks around the campground, a task that overwhelmed us from the start. Not that it was hard work…it was actually pretty meditative and nice. The issue is they had just cut down over 150 trees, which in return had left behind a large amount of debri. 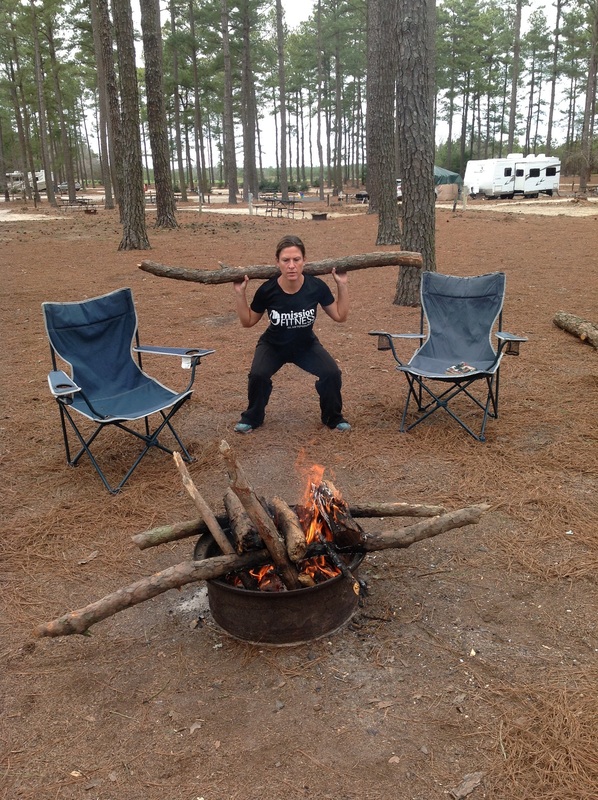 Each day we would give ourselves a goal: “let’s do these 4 campsites” and before we knew it, we had cleared the largest section of the campground (2 weeks later!) and it was so rewarding to see the areas we had completed and how great it looked. Not to mention several of the workers and members of the campground would tell us each day how they appreciated us and how good the campground was looking. Amazing what the word “appreciate” does. This was a great way to end our adventure. We were able to work and relax. 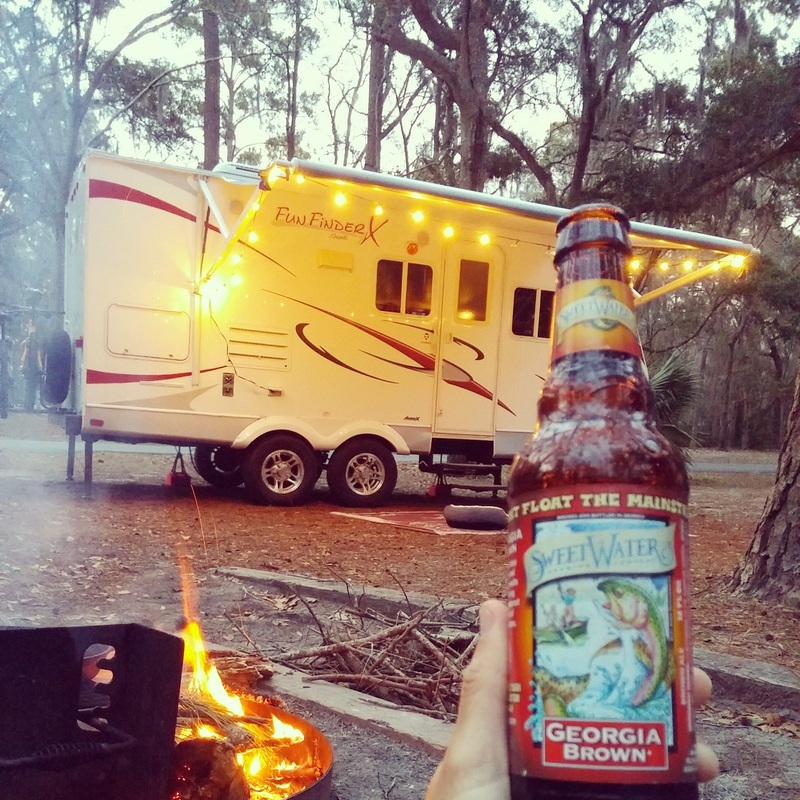 Enjoy the essence of camping, instead of running around like maniacs sight seeing and moving non stop. 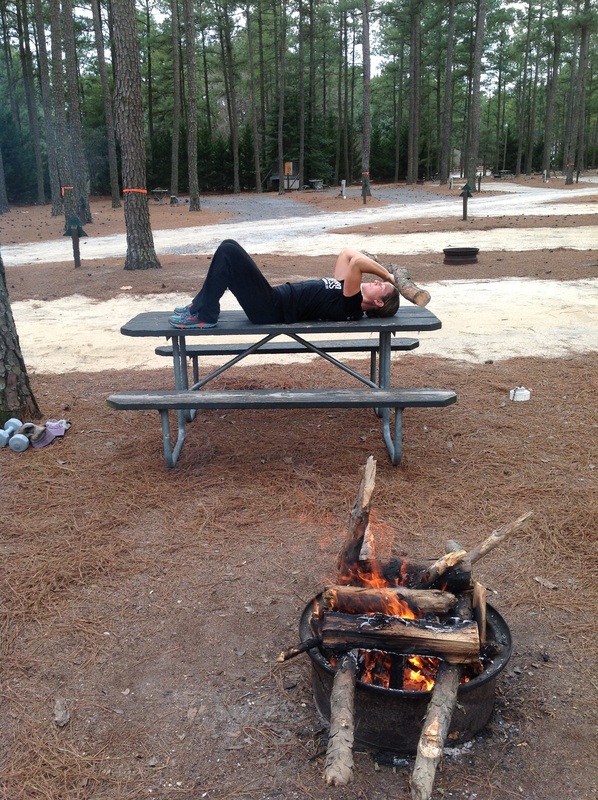 We were able to unwind, reflect, workout, talk, campfires nightly, try new recipes, clean and just LIVE. Stay tuned for reflections of this 5 month adventure…I am still trying to sort it all out myself. In the meantime I a excited to be back home, catching up with friends, working at the fitness studio and cooking in a full size kitchen. 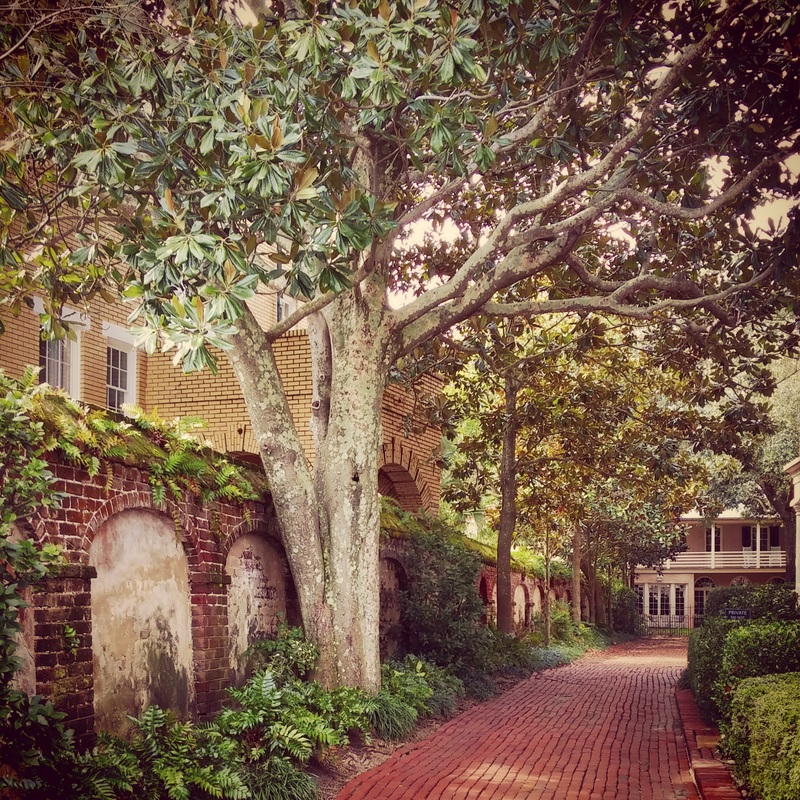 Charleston, SC…..the place everyone is talking about! 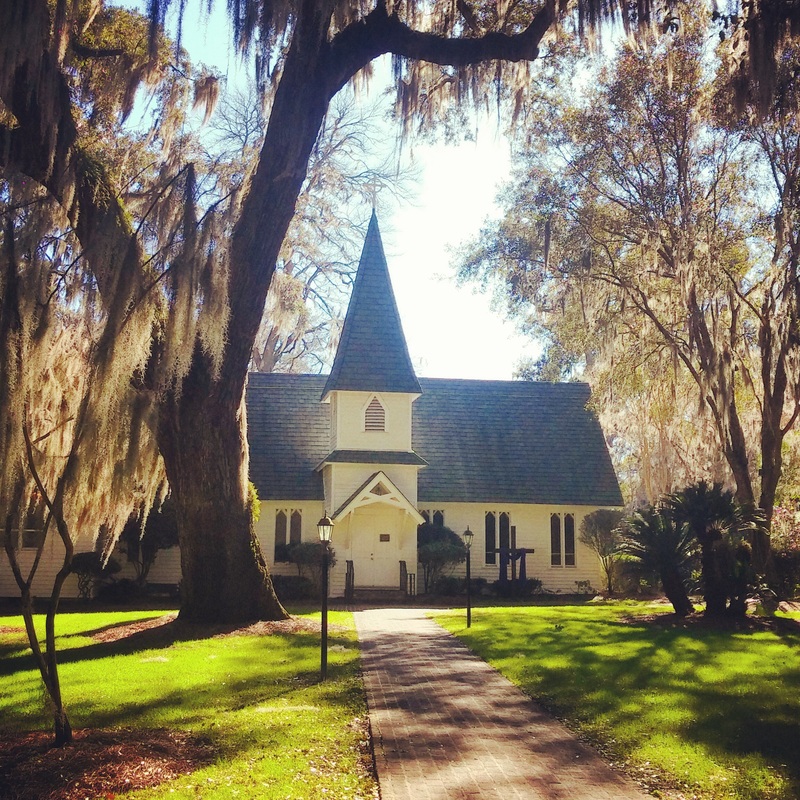 Charelston, SC may have been the most highly anticipated stop for us. 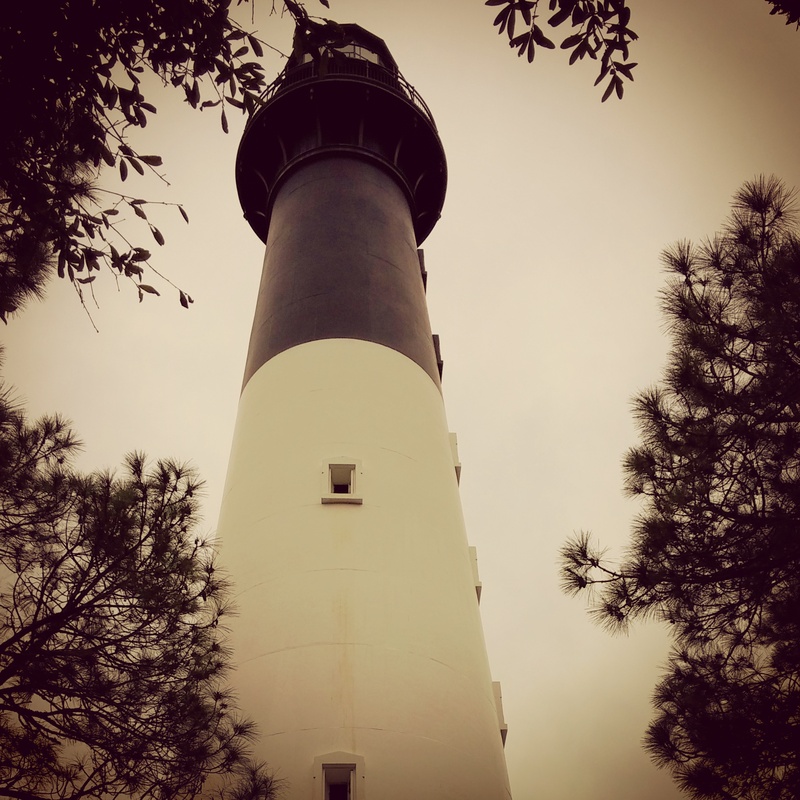 For the past 6 months when we told people it was on our “places to see” list, the response was overwhelmingly positive. So, with all of that being said, we made it our longest stay on our way to North Carolina. 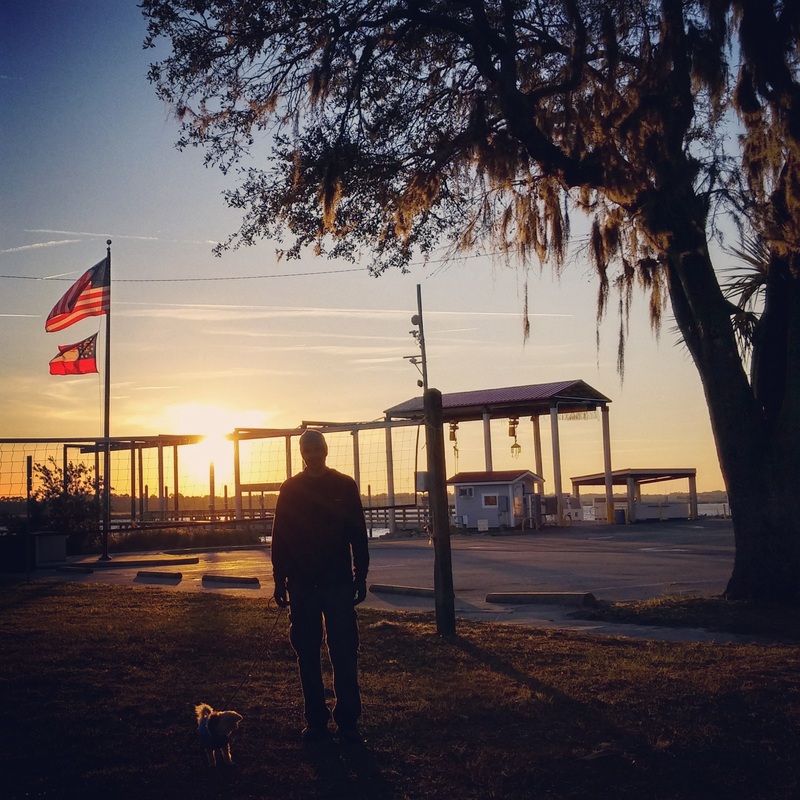 We stayed at James Island County Park for 4 nights, 5 days. 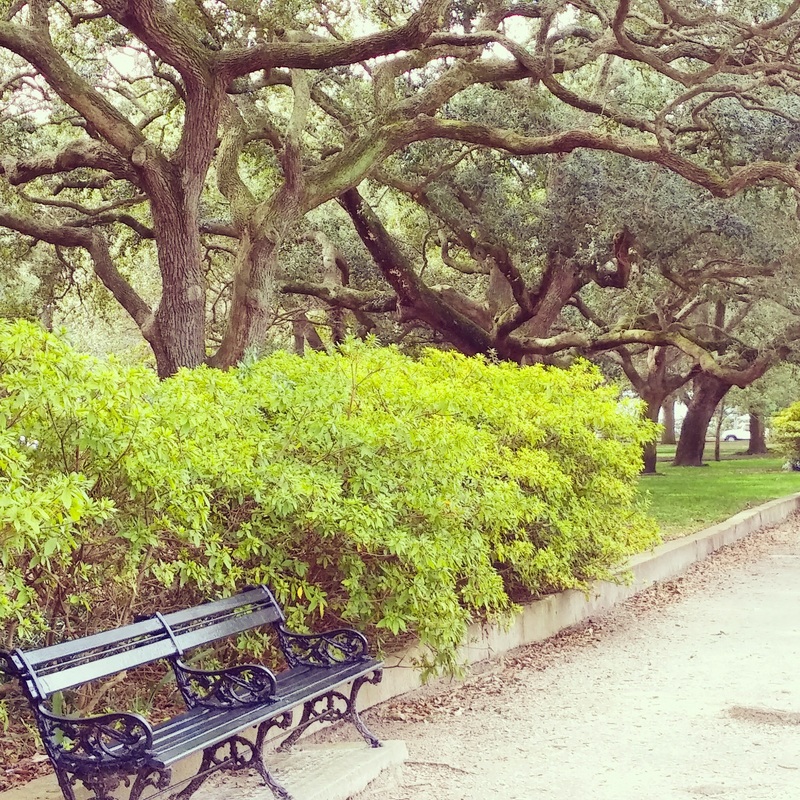 It was less than a 15 minute drive to downtown Charleston, and the park itself was worth a days visit. It was huge, with over 6 miles of running trails, a huge water park, a splash playground, a dog park, a lake, several ponds, and during Christmas they apparently hold a light show that can compete against any in the US. We spent the first day settling in…going grocery shopping and exploring the park. We bumped into a full timer, who spends her winters Workamping at James Island and summers working at gift shops at different National Parks. One great part of camping is the people you meet and the stuff you learn. Every idea of “normal” is suddenly (pleasantly) stripped away, leaving you with so many ideas, plans, and dreams. And the full timers seem so happy and so eager to help you pursue a similar life. 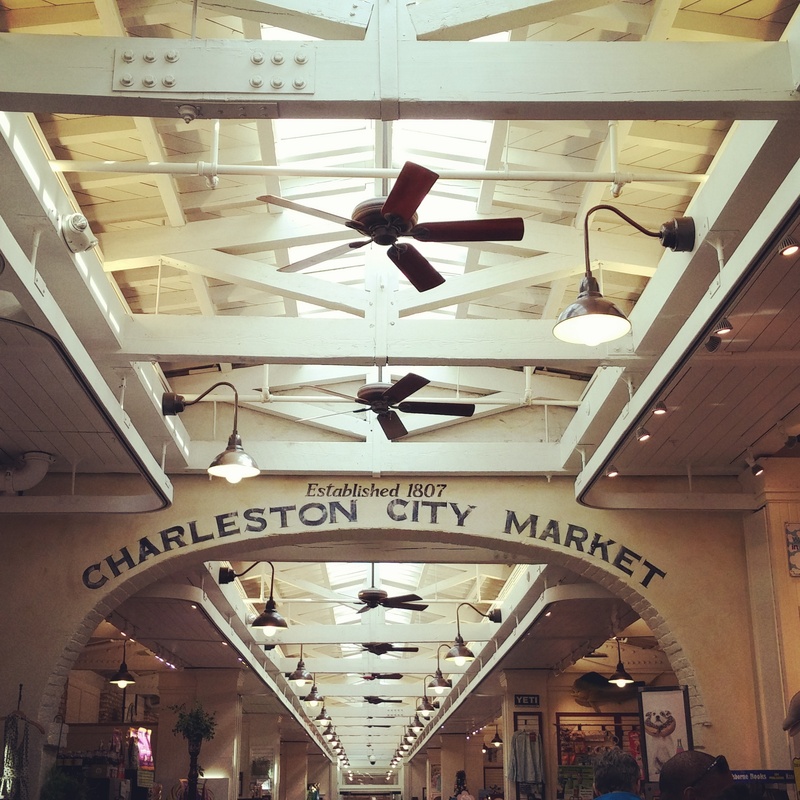 We spent the next day checking out downtown Charleston. It really was an amazing place. So many different sections. There was a lot of history. There was a lot of character. It had anything you would ever want. The next day we spent exploring different tourist attractions. I have to say that TripAdvisor has been my best friend during this trip. 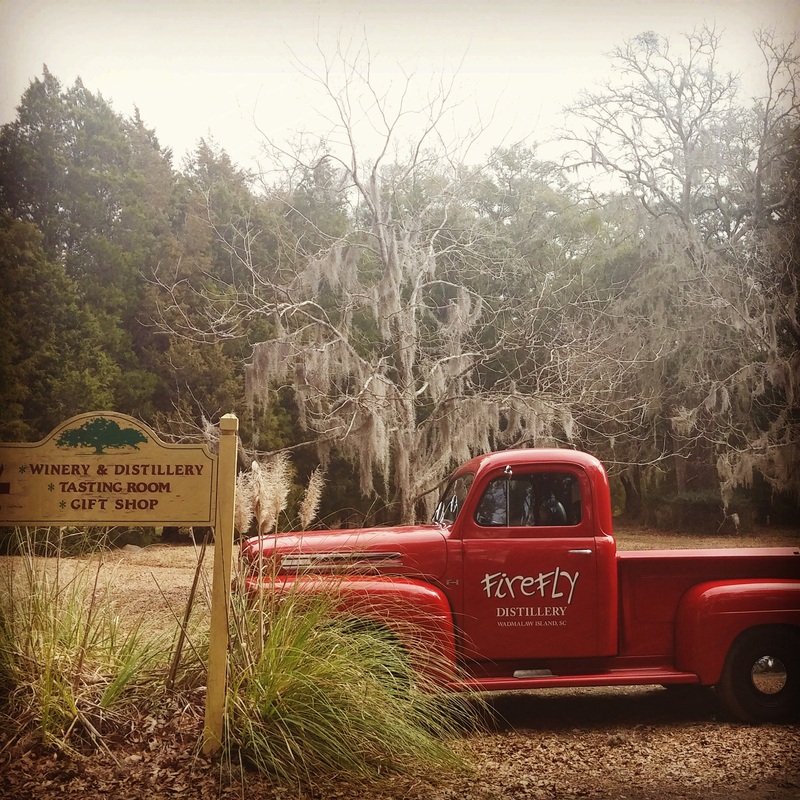 I found a winery/distillery that we visited. It was really awesome and different. 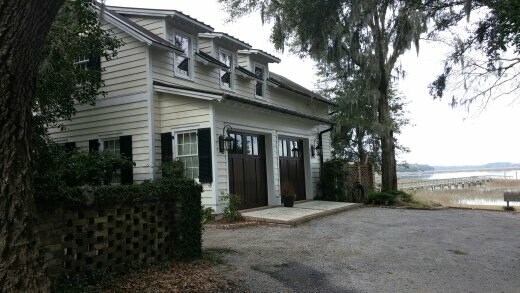 Definitely a Southern Style Winery. The next day we went back into downtown Charleston to explore..and get poured on :-). Oh well, even through sheets of rain it was a beautiful place! The campground we are currently staying at has recently cut down over 100 trees. This has left behind a lot of tree branches, which of course I immediately looked at as workout equipment! Since weight was a huge factor in our packing, I only brought two 5 lb dumbbells for strength work. So (as I love to do) I’ve needed to get creative. 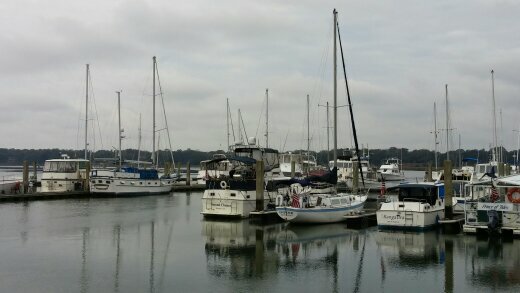 Beaufort, SC was on my “places to see” list for awhile. 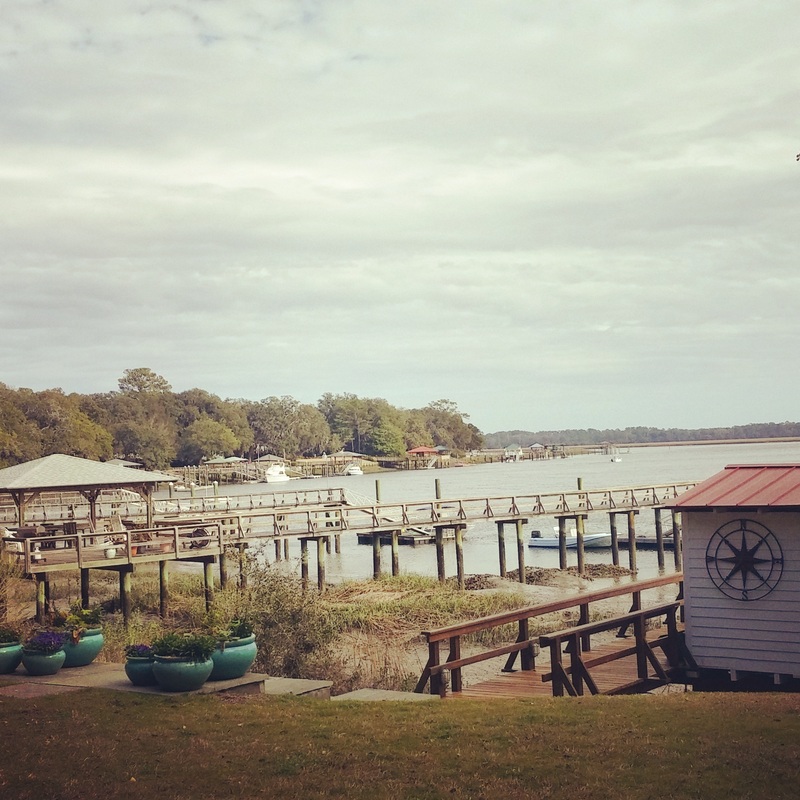 It originally sparked my interest back in 2013 when I saw it ranked #1 on America’s Happiest Seaside Town List in Coastal Living Magazine. 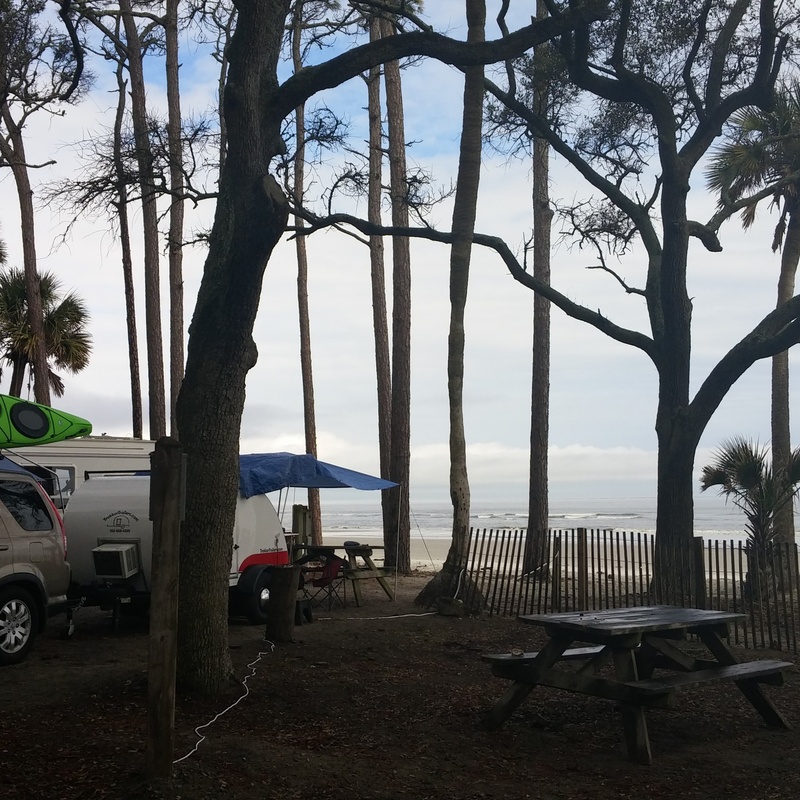 So, as we made our way up the Coast, we booked a stay at Hunting Island State Park located on one of the many Sea Islands in the Low Country. 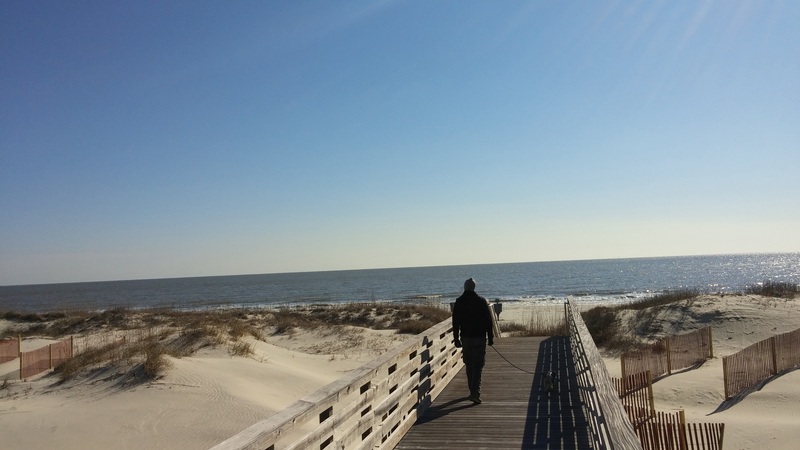 This State Park is the most popular one in South Carolina, offering over 3 miles of natural beach, over 5000 acres of undeveloped land, and just 15 minutes East of Historic Beaufort. When we arrived at the campground it didn’t take long to fall in love. 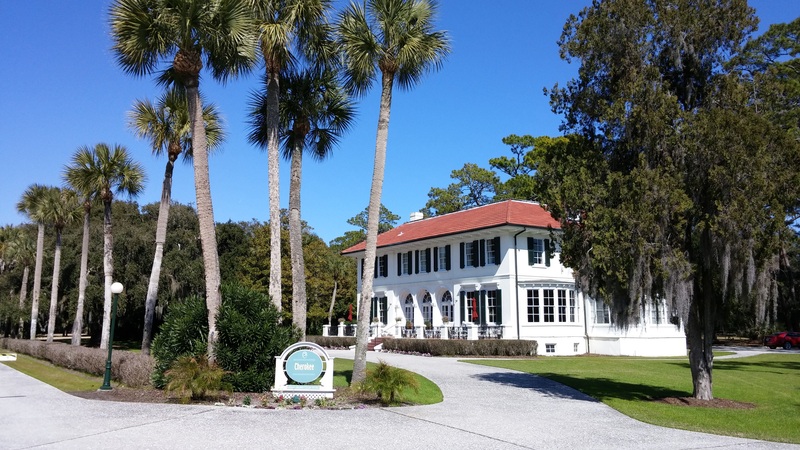 Once crossing a bridge and entering Hunting Island, it seemed as though you were on a secluded island. 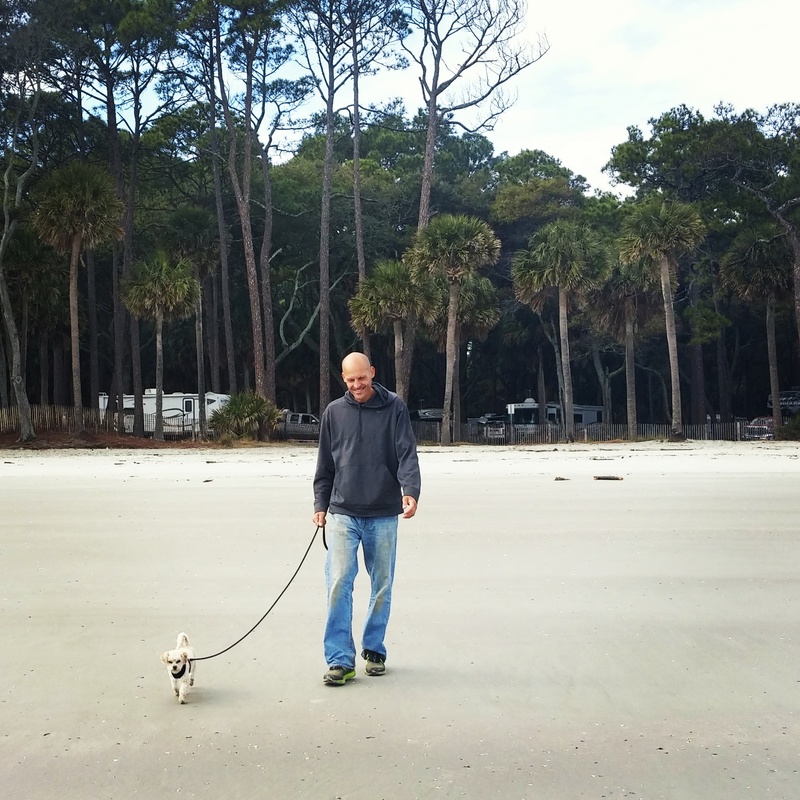 Then, we quickly realized that the campground was practically on the beach. I’m sure this was something I knew, and had seen in pictures during my research, but we were traveling and exploring so much that at times I don’t even remember what state we were in! Unfortunately, it was raining the day we arrived (common theme lately). 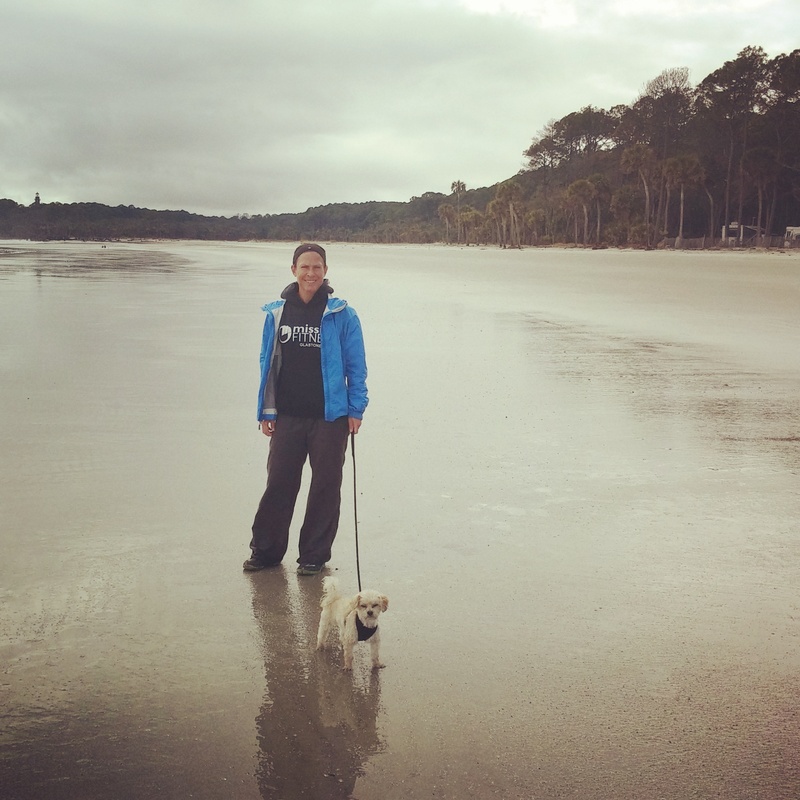 However, around 330pm the rain stopped, allowing us to get out of our camper for a walk on the beach…..
and the trails, which I quickly fell in LOVE with!! And then it rained some more…and more…and more. 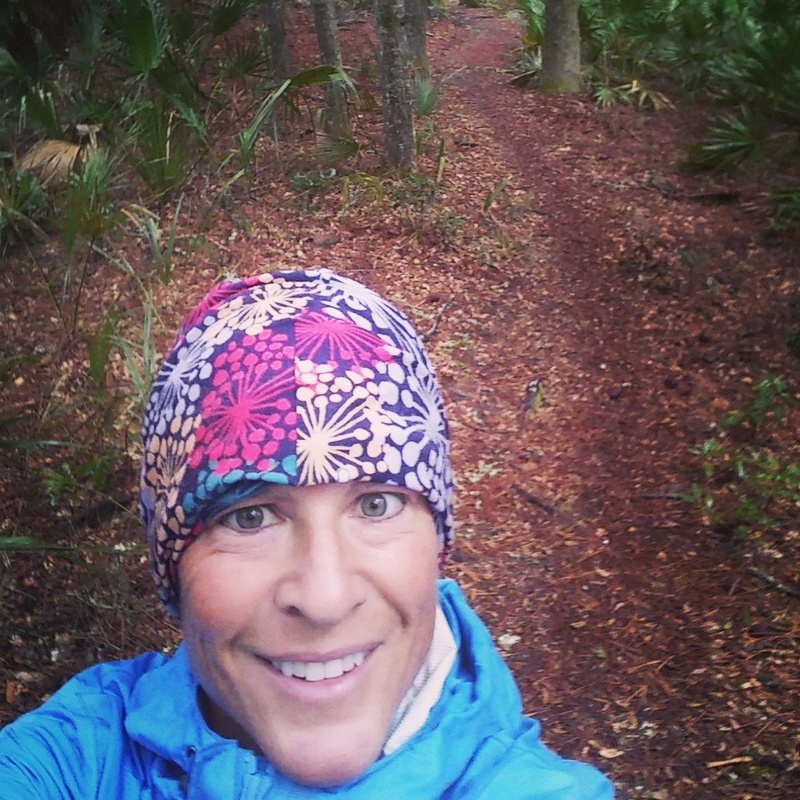 I couldn’t stop thinking about the trails…and even tough Beaufort School Systems were closed because of freezing rain, I went out to run 8 miles worth of amazing trails. 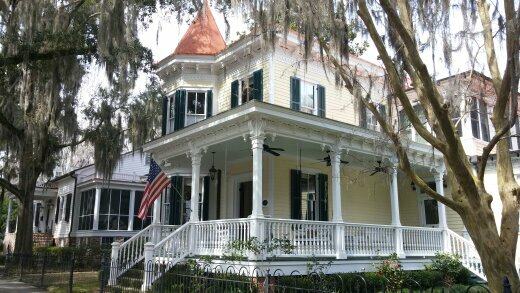 When it finally stopped raining, we ventured to Historic Beaufort area. 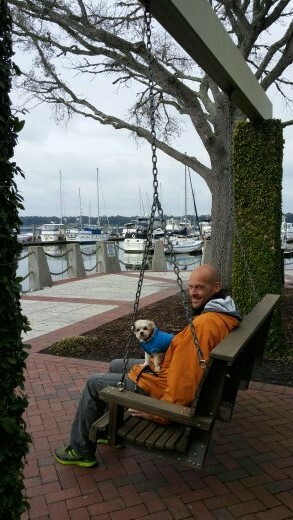 While it was still cold (probably in the low 40’s) we bundled up and got out there. And I’m so happy we did. As I have said in the past, the one good thing about the weather being as bad as it has been, it has allowed us to explore all of these areas that would normally be busy, in a way that makes us feel we are the only people on earth. 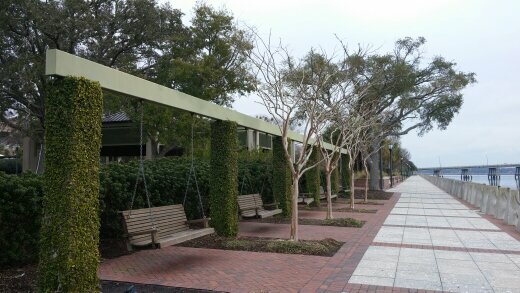 We sat on these swings as we could hear the gun shots in the distance, coming from close by Marine Corps Training Facility on Parris Island. This had a specific meaning to me, since it was where my Dad was stationed for bootcamp while in the Marines. 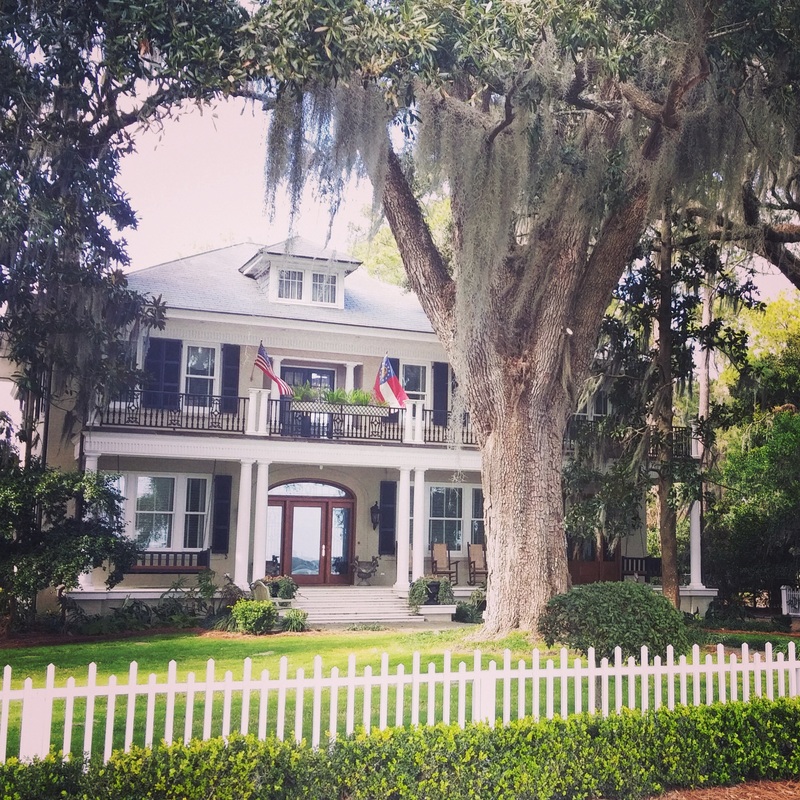 Then we made our way to the side streets, were just like Savannah the old Southern homes, with the Live Oaks with draping Spanish Moss stole the show. Each corner we turned brought with it a more beautiful home, as well as an unobstructed marsh view. This campground is definitely one that we will revisit, and hopefully we will be able to explore the area more with nicer weather! 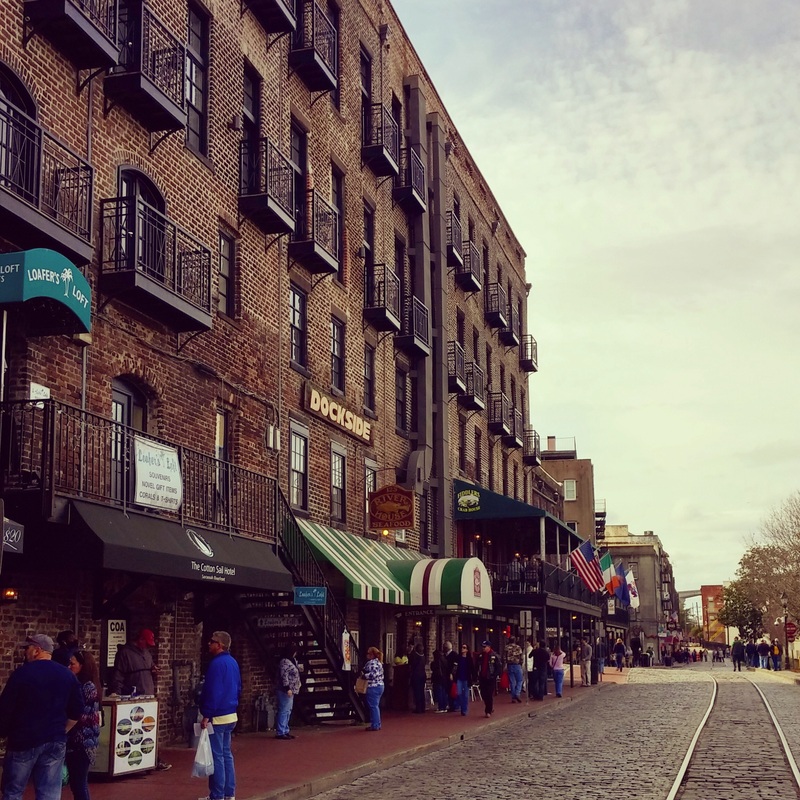 Savannah, Georgia was good to us in many ways. 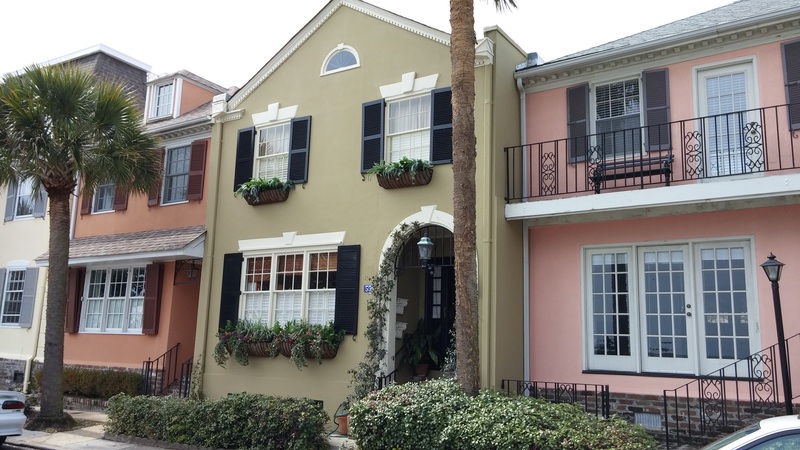 First, it gave us the best weather since we have left Venice, Fl. It was 65 one day and close to 75 the other. This made us hyper aware of the fact that WEATHER IS EVERYTHING FOR US!! It is truly my everything. It fuels the fire inside me. Cold weather dulls it. Clear and simple. 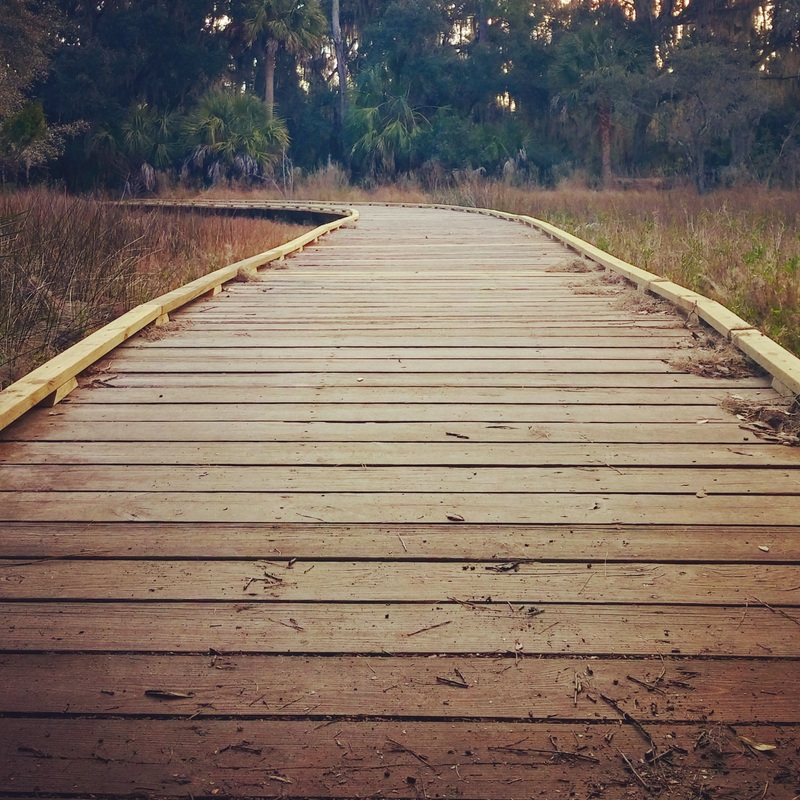 I had an extra pep in my step as I ran through and explored the beautiful trails that bordered our campground at Skidaway State Park. 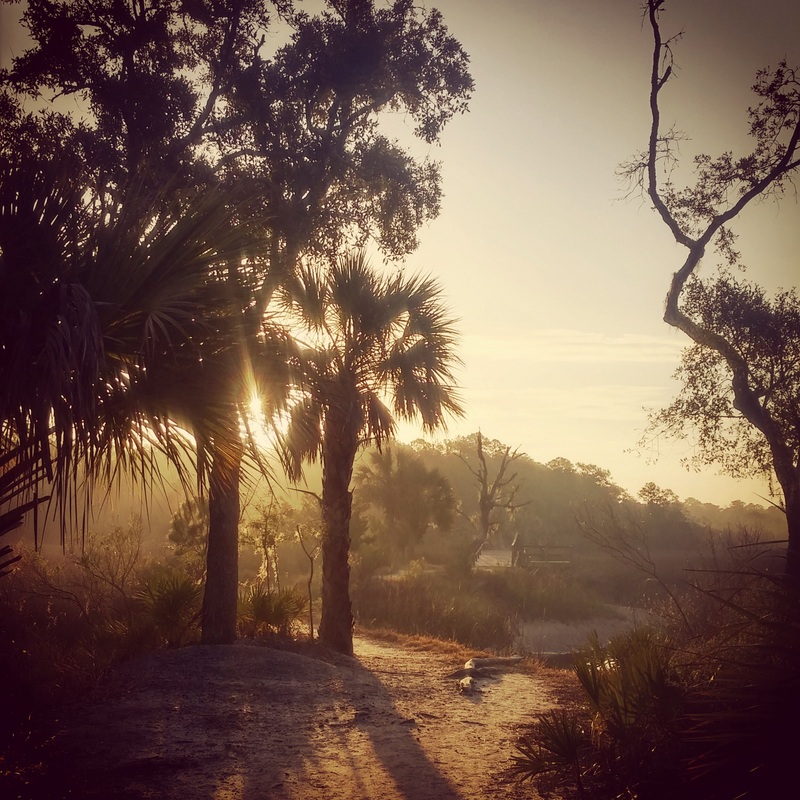 I watched the sun shine it’s light over the marsh as it rose on an early morning run and felt like every small worry I have is nothing in comparison to the vastness of this overwhelmingly beautiful world. 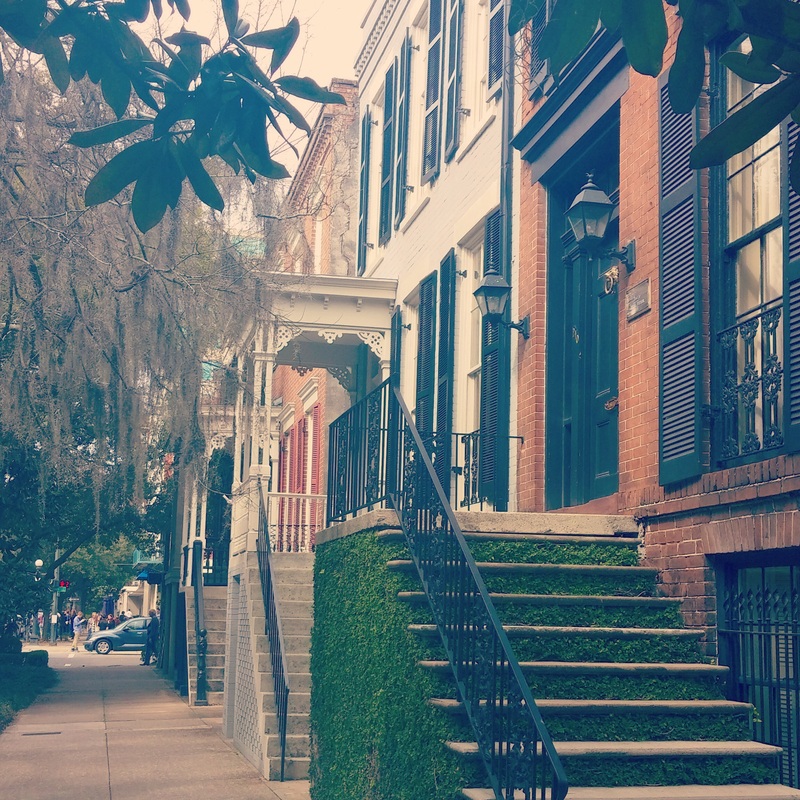 We explored the Historic District of Downtown Savannah with such excitement. The first day we had the map handy, making sure we saw all of the landmarks. The second day we left the map in the car and walked towards whatever caught our eye. The quote, “oh darling, let’s put the map down and get wonderfully lost” was all I could think of as we snaked our way through tucked away parks, tree lined streets, quirky homes etc. 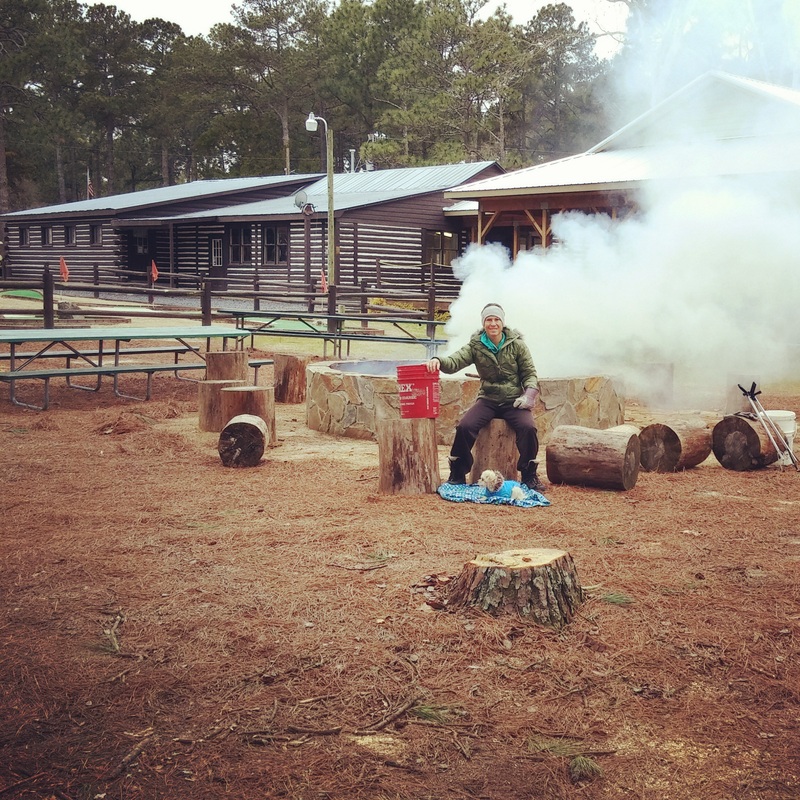 We were finally able to light a fire, which we enjoyed as we drank the local Sweet Water Brewing Company beer. Letting the sweet buzz take over as we watched the sun set …..and with a pink sky as a backdrop we asked ourselves, “is this for real?” We are living our dream and it is the best feeling in the world. 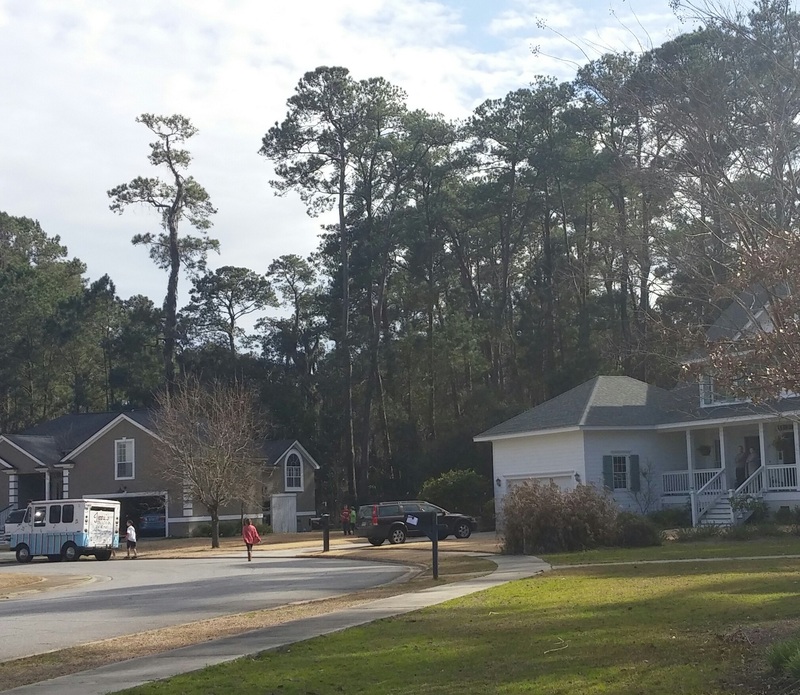 We took a bike ride around the Isle of Hope neighborhood and it almost brought me to tears. 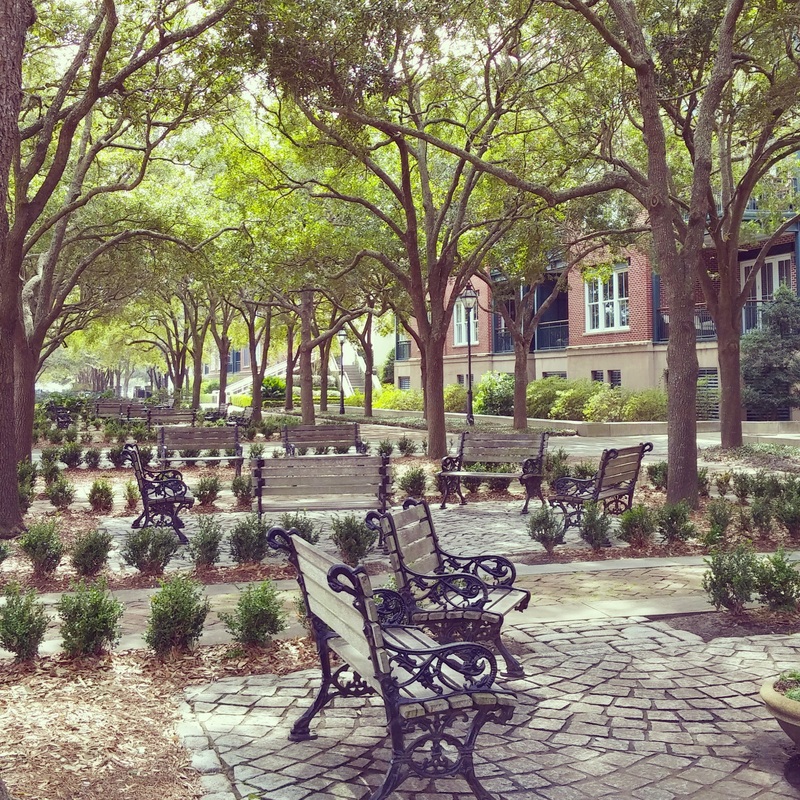 This is where the movie Glory was filmed and I don’t think there was a better way for us to experience the sweet southern charm of Savannah. 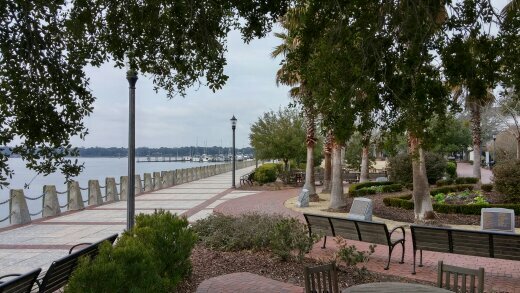 As we rode our bikes through the waterfront communityI would stop every 50 ft to take a picture and soak it all in. It felt like what life was like back when we were young. Kids were out playing. Neighbors we out talking to one another. The ice cream truck was literally driving around playing, “It’s a Small World”, while bubbles flew out the back end. Kids ran out of houses with dollars in their hand, as the parents stood on the front porch and waved and yelled hello to the other neighborhood kids. I am not making this up. 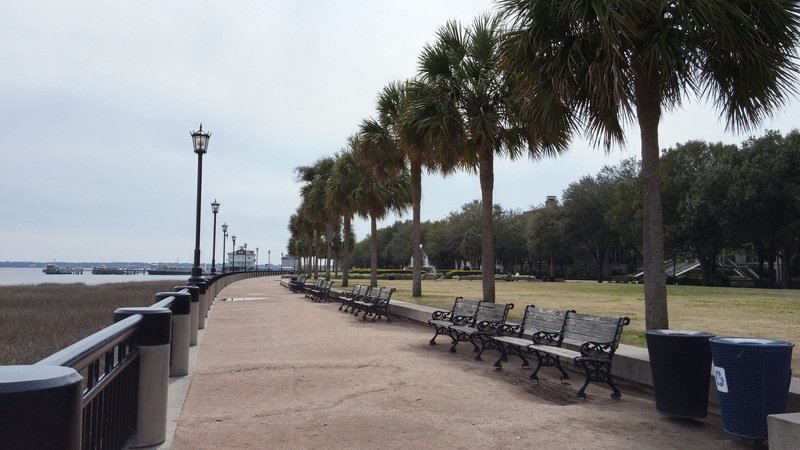 I felt like I had to look around to see if there was video cameras shooting Forest Gump II…which, by the way we also saw where that was filmed. 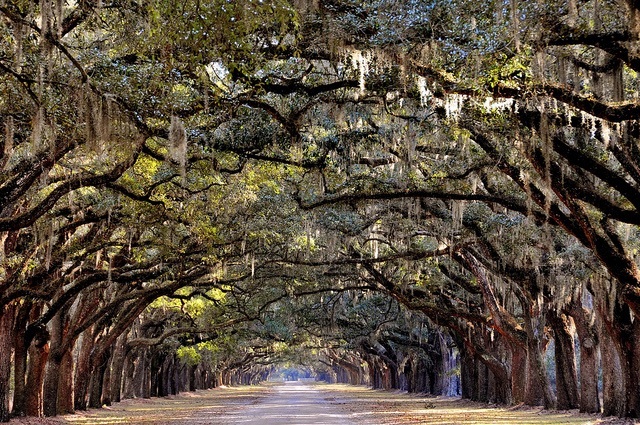 Right down the road at the Wormsloe Plantation. 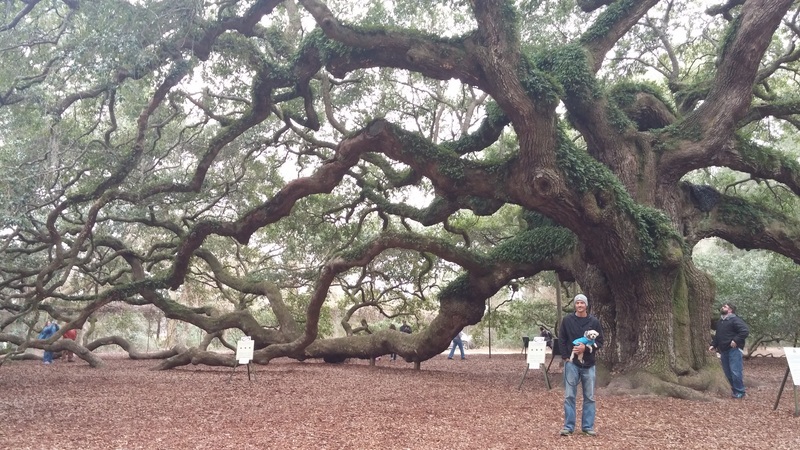 So, the charm of Savannah won us over, but it was the weather that stole the show. Sunshine and warmth is what warms our soul. The scenery along the way just adds to the fire! We officially departed the sunshine state and it did not go unnoticed by us. Southern Georgia blessed us with record lows, with the temperature barely making it’s way out of the 30’s during our first 2 nights. BUT, that did not stop us from exploring like we always do! 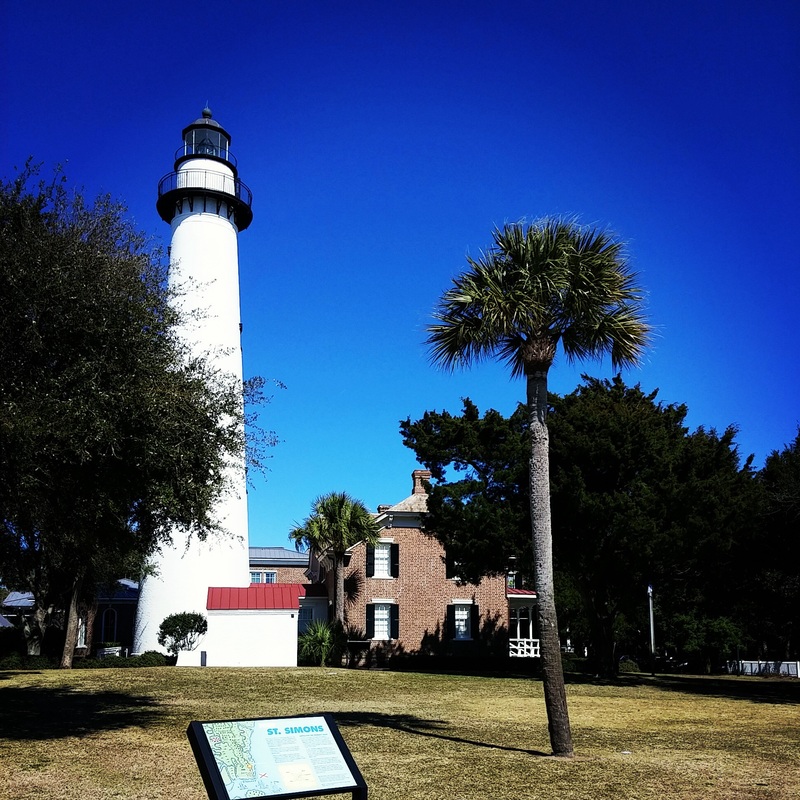 We stayed at Blythe Island Regional Park in Brunswick, Ga, just a short distance from St. Simons Island and Jekyll Island. The park got great reviews online and we could see why. 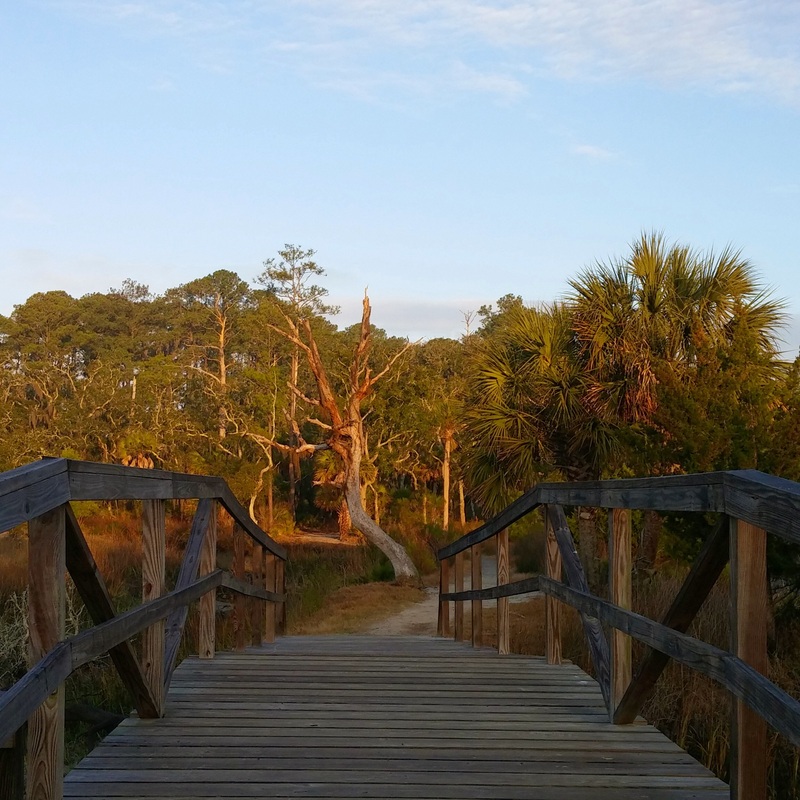 It was a beautiful park, surrounded by marshes and a huge fishing pier. 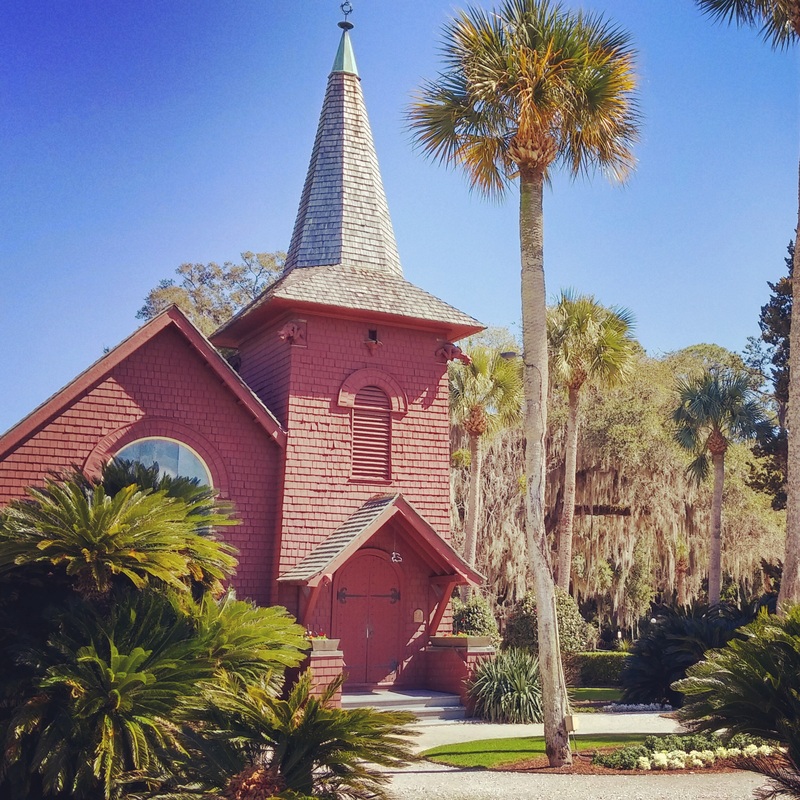 We visited St. Simons Island our first day which was voted America’s #1 Favorite Romantic Town as well as America’s #1 Favorite Beach Town by Travel + Leisure Magazine. Even with the freezing temps we could easily see what all the hype was about in this town. Does this picture not scream BEACH TOWN!?!? 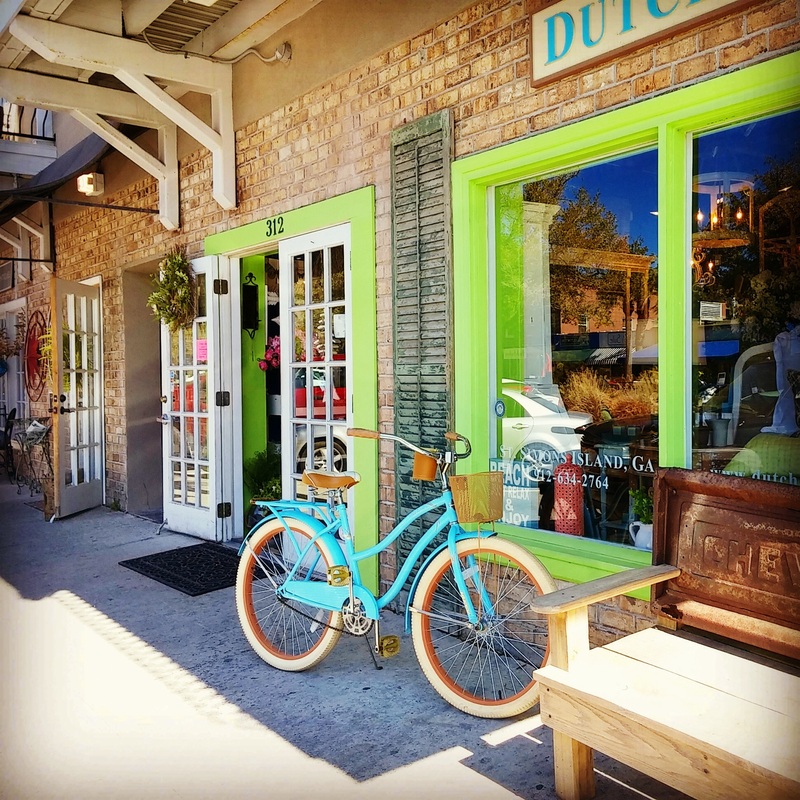 I was so excited to find the banner that I have had saved in my Shopping Cart at Natural Life at a cute little shop in St Simons. It was half the cost plus I always love purchasing from a store so that it comes with the memory of the day. I wasn’t sure where we would put it in the camper, and it actually didn’t look too good in the spot I had in mind. 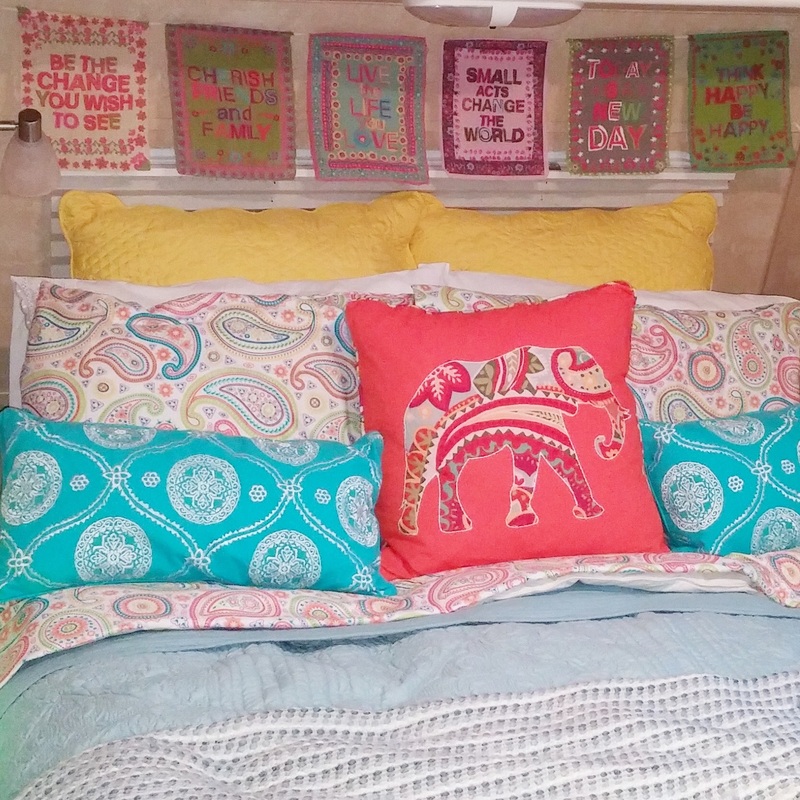 BUT, it worked perfectly to fit the spot above the bed I was trying to fill. YAY! 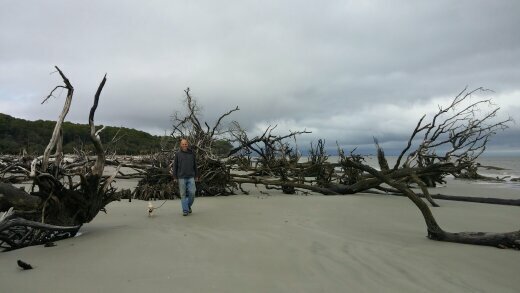 The next day we went to explore Jekyll Island. This day was crazy. First, the negative….. IT WAS FREEZING!! This island is perfect for bike riding, as it has the most amazing bike trail that goes around the whole island. I was not willing to give up a bike ride. So….we froze. SO. FREAKING. COLD. That being said, I had an absolutely amazing day. This island was magical for me. 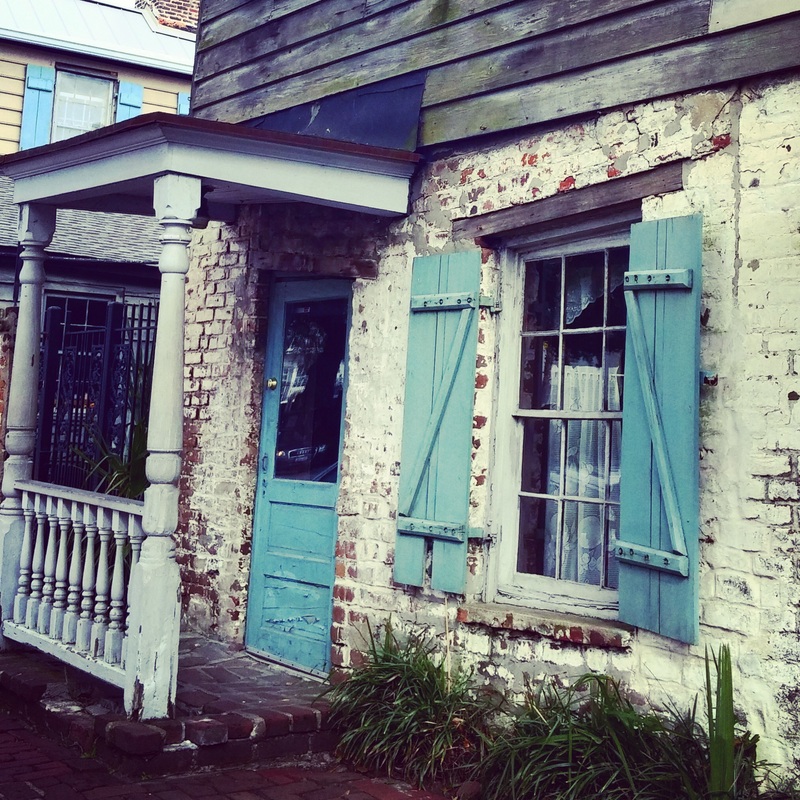 I NEED to go back when it is nicer….I may end up living there! 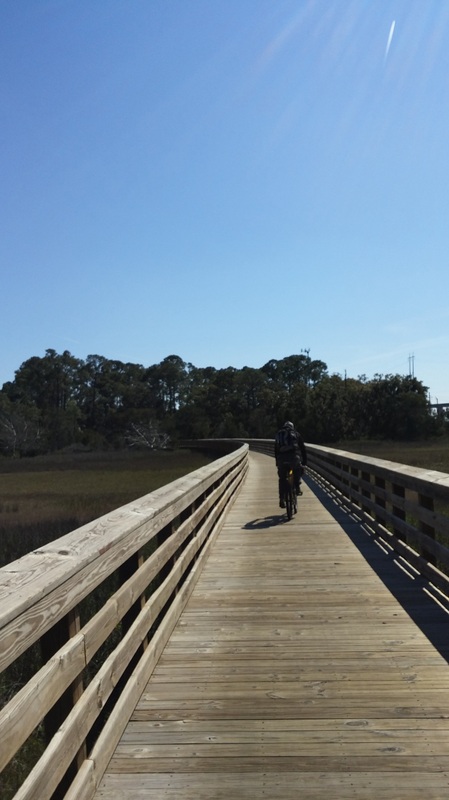 In the picture above you can see the bike path that winds its way through marshes, live oaks and past the waterways. 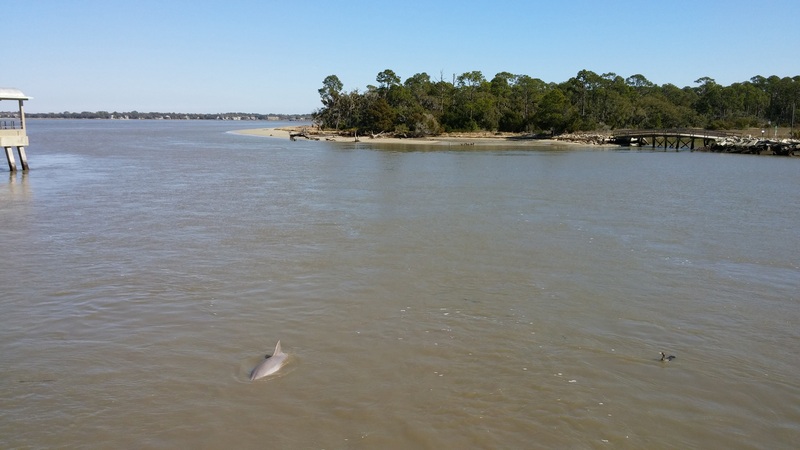 Below is the fishing pier where we were able to watch at least four dolphin swim and play until our fingers couldn’t stand the cold any longer. Again, in nicer weather, Erik would have had to drag me off this island. 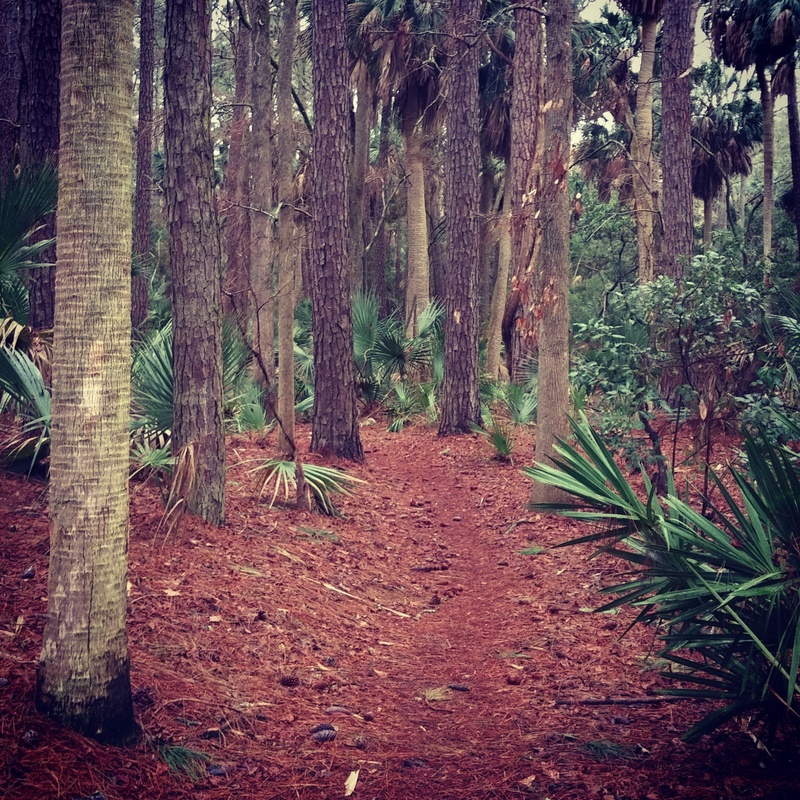 Jekyll Island, I will see you again.